Every 98 minutes, a dog is shot by law enforcement. Officer Fike crushes a dog’s back, throws the dog down a flight of stairs, and shoots the dog to death. Cops cheer “nice!” as they gun down Rosie while she hides in a bush. Officer Squicquero traps a dog in a small room and starves the dog to death. Officer Jones hangs Ricoh and kicks her as she swings on the noose. The officer drove his knee into the middle of Parrot’s back moments before shooting Parrot to death. 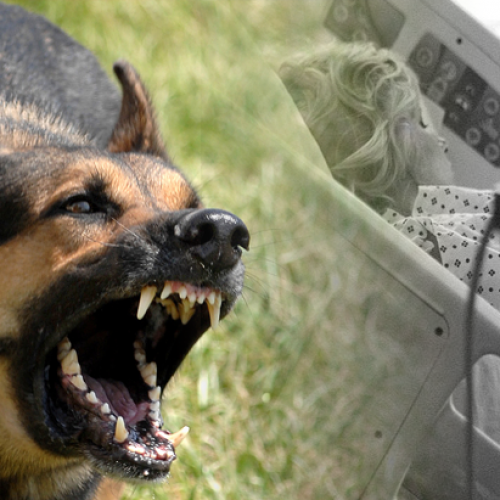 Do a search for “police shoot dog” and you’ll find millions of other cases. Every day, US police are killing the most defenseless members of our families. 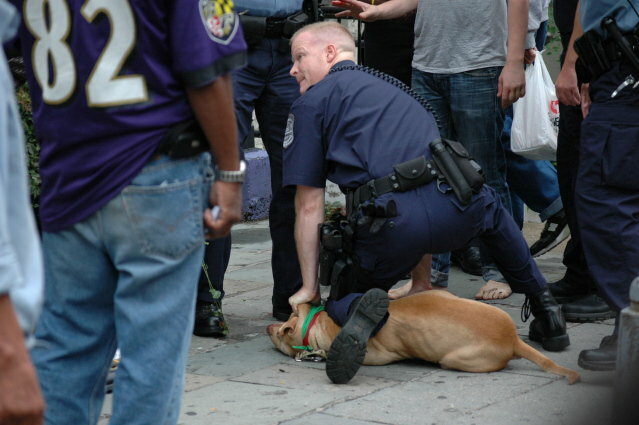 Many Americans still don’t know about the epidemic of cops abusing animals. And even more Americans are unaware of its connection to the growing police state. Oz and Patrick of Ozymandias Media seek to correct this. They’re calling national attention to the problem and they’re making a BIG documentary about it called Puppycide. I did an interview with Oz and Patrick and here’s what they told me. Oz and Patrick: We’re the director and producer of the documentary Puppycide (puppycide.com). We started our company Ozymandias Media four years ago and have been making documentary and educational content for the web. 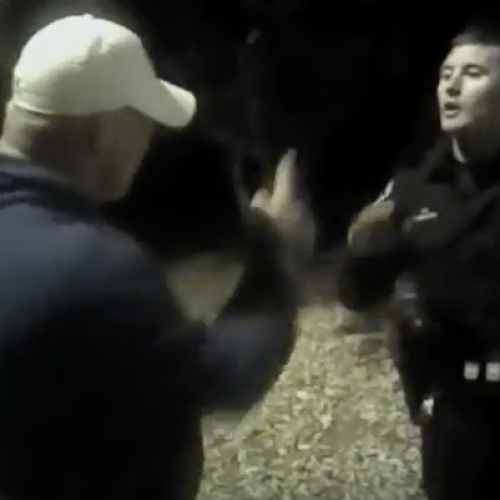 Filming Cops: What made you decide to create this documentary? 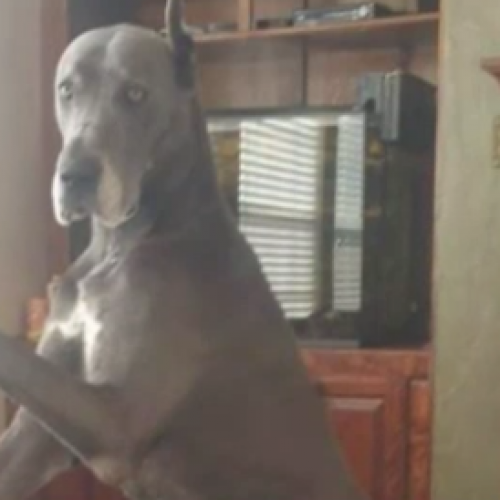 Oz and Patrick: We came upon youtube videos of police shooting dogs and were shocked. We wanted to find out if these were anomalies or a frightening trend. The more we dug into it the worse it got; the prevalence, the increasing incidents over time, the smaller dogs, the lack of recourse for victims. It just got worse and worse. And we realized the issue was thriving in the shadows where so many people simply had no idea this was happening. That is why we felt the time was right for a documentary. Filming Cops: Are there any cases of puppycide that particularly stand out to you, and why? Oz and Patrick: So many. It seems every time we think we’ve heard the most shocking incident another comes along that’s more egregious. Cheye Calvo’s (Payton and Chase) and Cindy Boling’s (Lily) stories haunt us because we met them and they brought us into their homes and selflessly relived the incidents beat by beat for our cameras because they believed in what we’re trying to do. It’s hard to keep a camera in focus when tears are streaming from your eyes. We also met with Leon Rosby (Max) at a protest in Hawthorne, CA. You could hear a chorus of hearts breaking when he disclosed that Max did not die instantly, that he bled in the street for hours. There are so many more stories that need to be told. We plan to cover as many as we can. Filming Cops: What do you think explains the increase in the number of dogs being shot by law enforcement? Oz and Patrick: It’s a perfect storm right now of 3 things: 1) Dogs are increasingly becoming ‘family members’ and moving from the backyard dog of the past to the living room dog of today. 2) Police are more present inside our homes and yards and neighborhoods due to concerns about terrorism, the war on drugs, and other changes in policing that find them running headlong into our dogs. 3) Despite the obviousness of the first two points, contingency plans, training, and tools are not being implemented to ensure a dog is dealt with non-lethally. Points 1 and 2 are likely to continue increasing. If point 3 doesn’t catch up, it is simple math that puppycides will continue to increase in frequency. Filming Cops: Have law enforcement officers interacted with you concerning the issues explored in this documentary — what has that been like? Oz and Patrick: We’ve spoken with Jim Ororio, a former police officer who now trains police how to read a dog’s behavior and use tools to avoid using the sidearm. He sees puppycides as unnecessary and preventable. But we definitely want to speak to police officers that disagree with him, and disagree with the general conclusions we’re finding in our discovery so far. The Puppycide documentary is not “anti cop” or “pro cop”, it is a film meant to shine a light on this issue so that the viewer can draw their own conclusions. We are confident that police WILL speak with us on this issue. We aim to do ride alongs, talk to K9 cops, and interview officers who have shot dogs. The current problem there is that it is bureaucratic and time consuming to set up. That’s one reason we are fundraising, so we have the resources to deal with that kind of stuff and make the documentary at the level this issue deserves. Filming Cops: What stage are you at in creating the documentary? Oz and Patrick: We’ve shot various interviews and stories across the country but we need a lot more. We edited a 7 minute demo but the final film must be 60 to 90 minutes if it is to reach the nationwide audience of millions who view documentaries on cable, Netflix, Amazon, etc. If our Kickstarter campaign reaches the goal we will continue production and editing with the aim of releasing the finished, full length documentary in the fall of 2014. If we don’t reach the full amount of our Kickstarter goal we receive nothing and the film won’t be finished. It’s simply too expensive to produce a film like this if you don’t have any funding. Filming Cops: What can we do to help you with the documentary right now, and where can we go to find more information about it? Oz and Patrick: The main thing we need is pledges at Puppycide.com. You will get your money back if we don’t reach our goal but that of course means the documentary doesn’t get any funding. So please consider making a pledge and check out the rewards we are offering in exchange for that pledge. Also at Puppycide.com you’ll find our short trailer up there, the longer demo I mentioned, and some of the Hawthorne protest footage can be found in the ‘updates’ section. You can also help by telling others about the project and following us on Facebook and Twitter. Thanks!